The story of story of Dashi-Dorzho Itigilov might be an interesting one, but the story of his body after his death is so much more interesting. 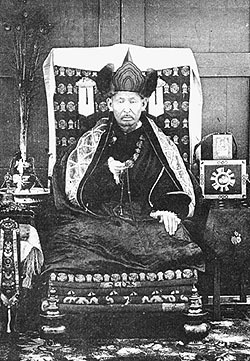 Dashi-Dorzho Itigilov (1852-1927) was a BuBuddhistsma of the Tibetan Buddhist tradition. During his lifetime he was selected to the post of the 12th Pandido Khambo Lama – head of Russian buddhists. He was a guest of the Russian czars and has helped Russian troops during WWI by collecting money and provisions. But the most interesting fact about him is the fact of his death legacy. At age 75 Itigilov asked other lamas to start meditation ceremonies for the passing, since he was going to die. The lamas did not start since he was still alive. So Itigilov started the rites himself and other lamas joined him later. He was in the lotus posture at the time of his death. His testimony was to bury him just as he was at the time of his death in a pine box and it also included clauses that demanded his body to be exhumed by other monks at later times. In the years 1955 and 1973 his body was examined by several Buddhist monks only to find that it did not decay. They have changed the clothes on the body and put him back in the pine box. In the year 2002, on September 11, after the fall of communist and very atheist Russia, his body was exhumed again and transferred to Ivolginsky datsan (a residence of today’s Khambo Lama). There it was examined both by scientists, pathologists and monks. Professor Viktor Zvyagin of the Federal Center of Forensic Medicine examined the body and concluded that it was in the condition of someone who had died 36 hours ago. After the exhumation of Itigilov’s body, it does not perish. There’s no fungus or other signs of physical decay. It is left in the open for display but no photographs of the dead are allowed according to Buddhist tradition. Yet, there are some photos taken in 2002, when his body was exhumed (see below). What do think of this rare phenomenon? PreviousIs qigong fading out in China? OK so the dude puts people on LSD and makes them watch the spinning lady — the result: He proves that the brain is indeed a quantum consciousness system (contrary to consciousness being an effect of materialism). The key point of this study is that “time” is an infinite potential whereas “frequency” is dependent on “complimentarity” — the same asymmetric logic that I’ve been emphasizing. Are you familiar with the concept of time-space, the inversion of space-time? David Wilcock talks about it a lot, and he references Dewey Larson. Basically, in Space-Time (normal physical experience), space is perceived as three dimensional and time as one dimensional. But in time-space, time is three dimensional and space is one dimensional, and when a person travels in time-space, they would be time travelling in space-time. David Wilcock basically says that time-space is the Astral plane. Do you have any comments on this? What’s that yellow looking stuff coming out of his eyes and going down his face? I’ve posted more links there with more photos. He’s still dead, isn’t he? I don’t see him rising on the third day and appearing to witnesses, so big deal. Mummification like this can be achieved through various means, not the least of which is prolonged consumption of various herbs. This is well known in Tibetan Buddhist practice. Looks like a big cabbage-patch kid. Maybe he can get a listing in Guiness as “least-smelly corpse.” Or maybe not, as the article doesn’t really tell us much about his odor. Did you see Christ rising on the 5th day, I sure didn’t. This was the case with Yogananda as well and then I saw recently a book on Catholic saints that had not decayed. It’s probably still on the shelf at the used bookstore in my neighborhood. In Mahayana Buddhism the goal is “supreme complete enlightenment” which means an immortal physical body sustained by “spirit-vitality” or light-electromagnetic energy. This immortal physical body supposedly can travel and manifest anywhere in the universe — and beyond. It’s actually a real conundrum — manifesting as the difference between Hinyana Buddhism (or Theraveda) or in Vedic philosophy Sanyka thought versus advaita. The emphasis in Hinyana buddhism is that the final achievement is not a physical immortal body but instead the formless awareness on its own.